The 2019 Nissan Titan XD is a large and roomy full-size pickup truck. This vehicle includes a full cab in its design, and this allows occupants to travel with the same level of comfort as they would receive from a full-size sedan. This iconic vehicle includes a large number of custom built and custom fit accessories, some of which are designed to boost personal and vehicular security. These features include tailgate locks and specialized wheel nuts. The Nissan Titan XD has a generously sized rear bed that comes in handy for hauling a variety of items. It also offers specialized Nissan Boxes that provide secure storage for tools and other items. Supporting the security features is the Titan XD locking tailgate system. The system includes a wireless fob that allows drivers to securely lock their tailgates remotely. The 2019 Nissan Titan XD also provides tools which help to prevent wheel and tire theft. Theft of wheels and tires can be a big problem, and vehicles with regular securing nuts make removing tires and wheels even easier for would-be thieves. 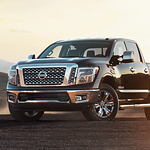 The Nissan Titan XD fights against tire theft with its available locking wheel nut system. These devices securely fasten tires to wheels, and they can require special keying tools to remove them. This system can stop would be thieves in their tracks, and greatly improves overall security.